Residents at Covenant Place retirement community recently enjoyed a tango inspired performance by the Cortango ensemble. Several seniors danced during the performance. Prior to the performance, Covenant Place sponsored tango lessons for the seniors and they learned about the benefits of the dance during a health presentation. “When music comes to Covenant Place, it’s like everybody wakes up,” Covenant Place Executive Director Joan Denison said. Dr. Gammon Earhart, who is a professor of physical therapy, neuroscience and neurology at Washington University School of Medicine, led the health presentation. The presentation, tango lessons and performance, are all part of the St. Louis SymphonyCares program. SLSO English Horn player Cally Bahnam, who is the Cortango band leader, said the best part about tango is the feeling it gives people. The performance also made Covenant Place visitor Harvey Altman feel nostalgic. He and his wife were among the seniors who danced during the performance. 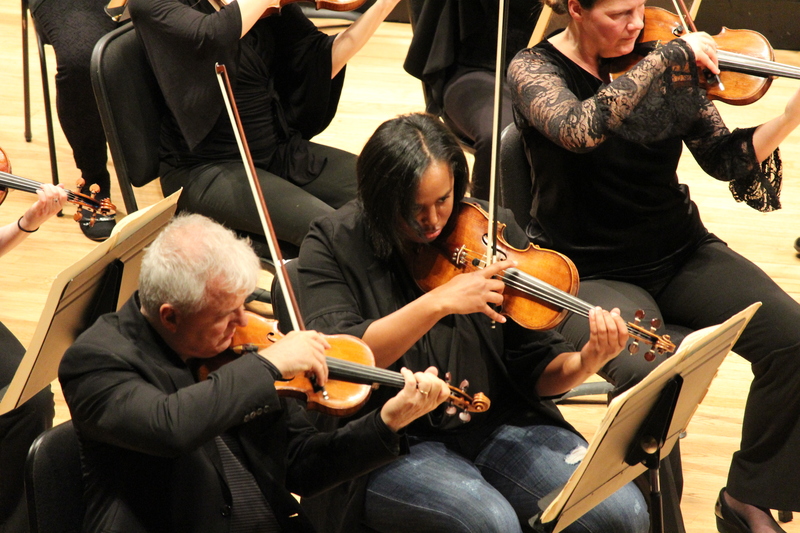 During the 2017/18 St. Louis Symphony Orchestra season, 90 music educators from 83 schools in the greater St. Louis area rehearsed and perform alongside SLSO musicians for the Extra Credit On-Stage at Powell experience. The side-by-side rehearsal and concert served as a celebration of music education and the extraordinary music teachers in our schools. To earn a spot on-stage, teachers had write essays explaining why they believe music education in our schools is important for our students. Led by resident conductor of the SLSO Gemma New, the teachers and SLSO musicians performed an exciting program during the free concert. “To play together with these teachers that are in the trenches everyday with the young people of tomorrow, is a tremendous moment for me as a musician,” SLSO Concertmaster David Halen said. Extra Credit On-Stage at Powell was presented by Commerce Bank. It was an eventful 2017 for the St. Louis Symphony Orchestra’s Stories from Backstage project. The television news-style videos documented the extraordinary impact the SLSO had in the St. Louis community. From free community concerts to ground-breaking work with music students, Stories from Backstage captured many of the special moments that SLSO musicians and St. Louisans shared in 2017. The video storytelling project is gearing up for another special year in 2018. Stay tuned. St. Louis Symphony Orchestra IN UNISON Artist in Residence Brian Owens delivered a powerful performance to accused teen detainees at the Family Court of St. Louis County Detention Center on Dec. 8, 2017. 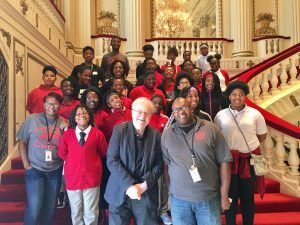 With an SLSO string quartet by his side, Owens performed hopeful music for about 30 teens. Janet Johnson, St. Louis County Detention Center Program Specialist, said she believes the performance will “inspire” the teens. The performance was part of the SLSO SymphonyCares program. It’s the same program that shared music with adult offenders at Missouri Eastern Correctional Center last year. SLSO musicians Ann Fink, Wendy Plank Rosen, Alvin McCall and Leonid Gotman were a part of both performances. This year’s concert featured nine pieces of music, including Christmas Carols. In addition to singing, Owens shared some positive advice with the teens. “I think it’s really important to share positive music and messages with these young people,” Owens said. Terrence Abernathy, 24, works as an usher for the St. Louis Symphony Orchestra. The job keeps the McKendree University graduate close to his passion. “I love being around the music,” Abernathy said. 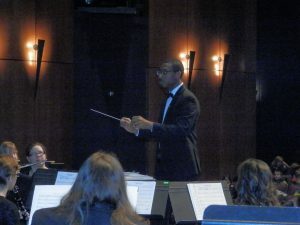 The St. Louis native dreams of becoming a conductor. “My dream is to be called maestro one day,” Abernathy said. In 2016, the SLSO created an IN UNISON Graduate Fellowship to help Abernathy achieve his dream. Through the fellowship, he attends rehearsals, studies music the orchestra performs, and meets one-on-one with conductors. The answer is simple, according to SLSO Music Director David Robertson. “You love something and to be able to share that love with others, and to see their love affair begin with it, is really the reason to do anything,” Robertson said. Abernathy’s connections with the SLSO run deep. He is a former IN UNISON Scholar, Youth Orchestra alum, and his mentor is horn player Thomas Jöstlein. Abernathy said the fellowship is another step toward his dream. “I am learning about conducting from the inside, and I am starting with, in my opinion, the best orchestra in the world,” he said. 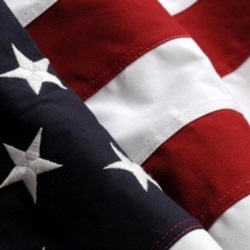 SLSO IN UNISON is supported by Monsanto Fund. 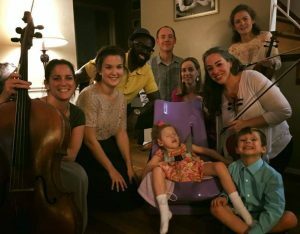 The SymphonyCares Heart Quartet plays music with a healthy message around the St. Louis region. The quartet includes three St. Louis Symphony Orchestra musicians and a cardiac surgeon from Saint Louis University Hospital. Dawn Hui, M.D., a graduate of medical school and Juilliard, is a founding member of the quartet. “It’s a real honor and a privilege to work with these musicians,” Hui said. Joo Kim, Xi Zhang, and Ann Fagerburg round out the quartet. In addition to playing beautiful music, the quartet shares life-saving information with audience members during performances. 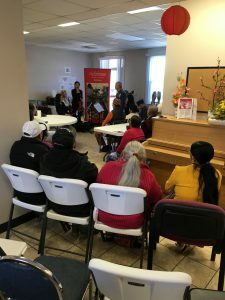 The quartet also plays music from composers who suffered from heart disease and pieces that have some connection to heart disease. The quartet’s last performance was at the Mackland International Senior Center. The audience included several dozen immigrants. For more information about the SymphonyCares Heart Quartet click here.